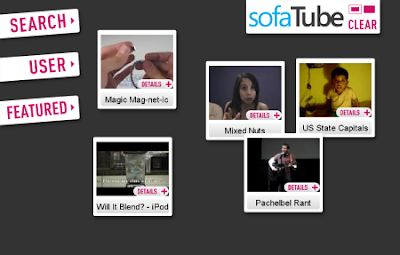 SofaTUbe...Watch YouTube from your sofa! Now you can watch YouTube and Revver from the comforts of your sofa, thanks to RedKawa who has released a service called Sofatube which features an interface that’s optimized for viewing from far away, rather than two feet away on your desk. According to Pete Cashmore of Mashable.com, SofaTube is being promoted for use on home theater PCs, the PlayStation 3 and (once the Opera browser is released for the Wii tomorrow) the Nintendo Wii, too. The use of Ajax means that there are no page loads. Now what would be really interesting to see is the reaction of YouTube to this method and may be some copy right issues. Talking about copyright issues it would be hard to not mention the $1.65 Trillion lawsuit that RIAA filed against the Russian site Allofmp3.com today. Yes a massive 1.65 Trillion!